Cold Stabilised. It can provide you with incredible health benefits. Obtained from our own ecological plantation, it has a high percentage of active principles such as vitamins A, C, E, K, B6 and B12, minerals (calcium, zinc, phosphorus…), essential and non essential amino acids, polysaccharides, proteins, and oligoelements due to the maturity of the plantation (over four years). The synergic way in which each of its components act (“combined work”) bestows the juice with extensive properties such as bactericide, antiseptic, cellular regenerator, anti-inflammatory and healing agent. Due to its composition, those who ingest it say they feel healthier, with more vitality, since among its functions are the regulation of the internal organs and organic systems (sugar, cholesterol…) as well as the alleviation of indigestion, stomach acid, gastritis, duodenal and stomach ulcers. Before and after sunbathing. Very effective against sun burn. Traumatisms, injuries with broken skin, grazes and sores. Skin disease (acne, dermatitis, eczemas, haemorrhoids, blemishes, psoriasis and stretch marks). Rinses for any mouth or laryngeal infection (dental, gingival, dysphonic pains, laryngitis….). Skin care: wrinkles, tone and texture. 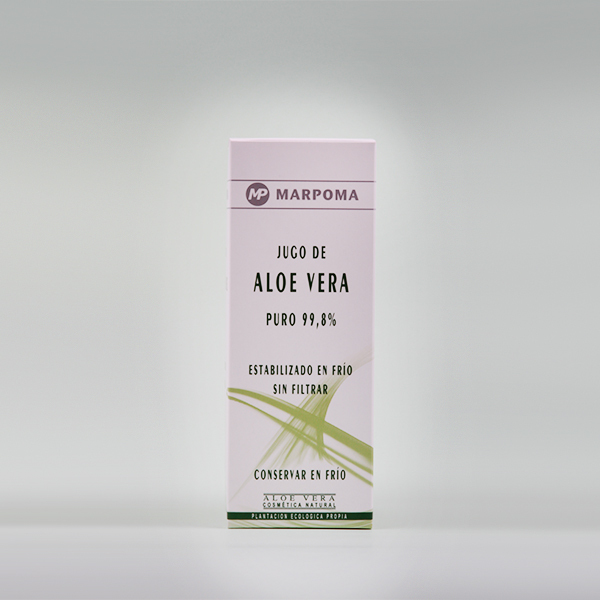 (Due to its astringent properties it is recommendable to apply a moisturising Aloe Vera cream once the juice has been completely absorbed). Insect bites and jellyfish stings. As it is a natural product, the juice may vary in taste, colour and consistency between productions. This does not affect the quality or effectiveness of the product. No added water, concentrated nor powdered substances. Presentation: 250 ml. and 500 ml containers.